Trouble with the curve: An old baseball phrase as trite and cliché as the Clint Eastwood movie titled after it. But as the game has evolved, that cliché has never lost its relevance. The curveball remains a mystical entity, difficult for pitchers to master and even more so for hitters to solve. 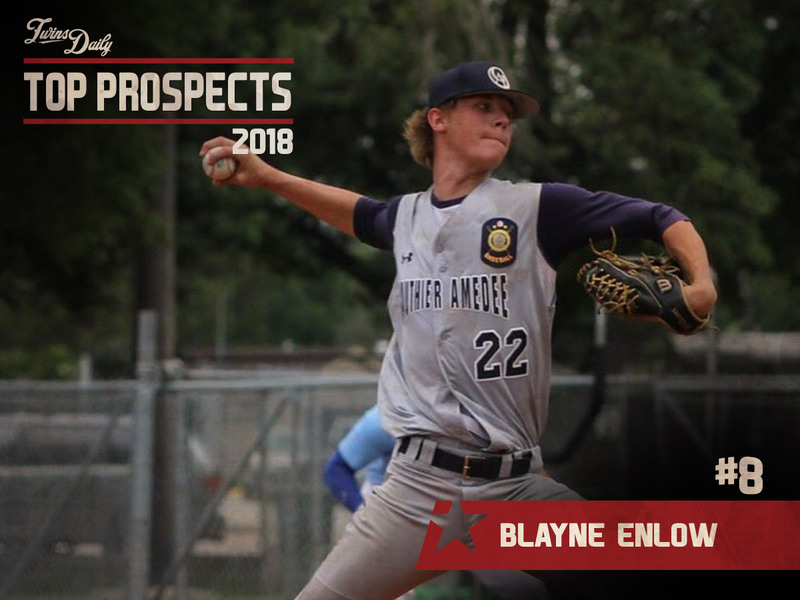 Blayne Enlow, still just 18 years old, has no trouble with the curve. His special ability to spin the baseball helps him hook a spot among our Top 10 Twins prospects fresh off his pro debut. "He can spin the ball, which is hard to teach." Those were the words of Twins scouting director Sean Johnson when first explaining Minnesota's third-round selection in the 2017 draft. And it's very true. Last summer, Tom Verducci penned a big feature for Sports Illustrated on the resurgence of the curveball as a premier pitch in MLB. "Organizations have learned," he wrote, "that if someone does not show an aptitude to spin the baseball as an amateur, it’s foolish to expect him to acquire the skill." It is, of course, still very early, but so far Minnesota's scouting department looks to have hit the bullseye and added one hell of a pitcher. Enlow made only six appearances in the Gulf Coast League after signing, totaling just 20 1/3 innings, but his performance was almost spotless. The projectible 6-foot-4, 180 lb right-hander turned in a 1.33 ERA with 19 strikeouts and four walks, allowing just 10 hits and one home run with a 55% grounder rate. As a high school senior at St. Amant, he had fanned 101 over 76 frames with a 0.92 ERA. His signature curve is already making waves in the pros. Baseball America recently ranked it as the best in the Twins system. GCL hitters were overmatched and couldn't do much with it. The pitch breaks so hard that some see it as more of a slurve, and TD community member Bob Sacamento went so far as to say in September that "[Enlow] showed me the grip and it's a slider." Regardless of what you want to call it, it's a phenomenal pitch, and Enlow's ability to combine it with a power fastball with stellar command at the age of 18 is beyond promising. You might be asking yourself: If this kid's so good, why did he slip to the third round of the draft? Well, that's a little misleading, because he signed for late-first-round money. It is quite likely that other teams were aware of his arrangement with Minnesota. But there were legitimate concerns cropping up around Enlow that caused his draft stock to drop a bit. Namely: a dip in fastball velocity, from 94 MPH during his junior year to the upper-80s early in his senior season. That can be a very troubling sign, but the velo rebounded as the draft approached (likely alleviating any reservations for the Twins), and he was reportedly back to touching 94 in the GCL. Of course, the problem with dominating so thoroughly on the strength of two pitches is that he's never had much need to work on a third. Enlow's changeup lags behind his heater and breaking ball, but that's not rare for a pitcher at this stage, and most believe he can develop his third offering into something at least usable. That question mark, and all others that generally apply to a teenage pitcher who hasn't yet played above rookie ball, keep Enlow's prospect standing in check... for now. The temporary decline in arm strength late in his prep career might help explain why the Twins took it quite easy on Enlow during his first foray into the pro ranks, using him almost exclusively in relief and always with big breaks in between outings. They'll probably continue to exercise caution in the next couple of years, but as he fills out, there's little reason to doubt his ability to stay healthy and maintain velo. Turning 19 next month, Enlow will likely start the season at the next step of rookie ball in Elizabethton, but it would surprise no one if he surfaced quickly in Cedar Rapids. Any level of success there, as a teenager, would put him on track to beat out our (fairly aggressive) estimate of an MLB arrival in 2021. TD Top Prospects: #7 - Coming Tuesday! Get to know more about Enlow and much more in the 2018 Minnesota Twins Prospect Handbook. I am more than aggressive and hoping for 2020.Depending on his third pitch, move him up fast. While still concerning, that dip in velocity his senior year must be the reason he dropped out of the first round (where all bonuses were > $2MM). A plus curve, 94 MPH fastball, projectable frame and good control at 18 years old seems like a recipe for high first rounder. Twins may have gotten very lucky he dropped - and then executed the strategy perfectly to grab him in round 3 with an over-slot bonus. Yes, to all that. Enlow is definitely one of the more intriguing and exciting young pitchers in the system. Love the potential! Hoping he stays healthy.If he does, sky is the limit for this kid. But looking at the list and who is left, it looks like 10 or 11 of the Twins top 20 prospects have not played above Low A. Really, really like his potential, what worries me is 8,9,10 are complete crap shots. and you might say the same all the way though 13? It's probably not "normal", though it's also probably not normal for a team to have 5 position players under 26 who already have 200+ MLB games under their belt too. It'd be interesting to see how a "typical" top 10 list looks in terms of where players are. That's why they're 8-13 probably. And, I'm sure that most team's prospects after 6-8 are crap shoots. Seth (9), Nick (7), Cody (12), Tom (12). Any chance the Twins send Enlow to Cedar Rapids after he pitches in EST? I mean I remember Lewis Thorpe going straight from the GCL Twins to Ceder Rapids, could the Twins do the same for Enlow given Enlow’s potential? I think y'all should watch Enlow in action before you make up your mind. He looks great so far. Sounds like we might have got a steal. By the time a prospect is recognized as having the type of potential that Graterol, Badoo, and Enlow have, the chances of them being eventual contributors increases dramatically, maybe to as much as 40-50%. I don't know about you, but I think I'd label them as better than crap shots. Their odds are now probably better than those of players selected in the second half of the first round. I LOVE the potential in all three, but crap shoot, coin flip it is all about the same. I really hope I am wrong and all three are starters in MN for years, but I am just being realistic. Totally agree, it might be a sign of are young guys in the majors and a few of are other "prospects" failing off that leads to this. But there can be no denying we have a ton of talent in the low minors, now lets hope it returns us something in a trade or they make big impacts at Target Field in a few years. I'm guessing Bert be home Blyleven and Blayne will have a few conversations that I would love to be a fly on the wall at! Yep, and I'll take a coin flip every day of the week for any IFA selection, any 3rd-rounder, and for sure, any later round pick like Badoo, Garver, Hildenberger Rogers, et al. No one can argue that. IMO I would turn a few of those coin flips into players that can help us now, before those coin flips come up tails. I think you are greatly overstating the odds of those three producing in the big leagues. There have been numerous studies (example: http://www.thepointo...pdated-edition/) that have shown that even prospects ranked as high as 25-50 nationally have only slightly better than 50-50 odds of above replacement level careers. I like Badoo a ton, but I still think he probably only has a 25% chance at being a big league contributor. Graterol and Enlow are both intriguing, but as super young pitchers their odds are still extremely daunting. He's going to cost a lot of minor league batters their jobs. "Can't hit the good curve." Whether that translates into a job in the majors where batters can hit (or lay off of) the good curve, is of course what will decide things for him. Wow, that is such a simple, clean kinetic chain on Enlow's delivery. See how he brings his throwing hand in tight to the right side of his neck? That's where the energy-efficient final stage comes from. Similar to how Andy Roddick hits a tennis ball 140 mph. It's also where Enlow's tight spin comes from; the same energy can be channeled through the ball or around it. He's got a good pro curve right now, and his heater explodes out of his hand. With that delivery, his changeup might be difficult. He's got so much velocity in his hand. Also I like the down plane of his delivery. Bert will like that, I bet. ALL above average players were once prospects.If 3 or 4 in your top 20 and one outside of your top 20 end up good and the list cycles every 4 -6 years and each of those players has a 7-10 year career I guess it comes out ok since I am guessing most teams go through quite a few replacement level players to fill out rosters.I'm just pulling numbers from a cloud here but you get the idea. As far as Enlow goes, I knew very little about him before now but his delivery looks pretty good and I love stuff that doesn't just involve velocity. I also hope he gets on the fast track through the system. I know HOFers don't come through every day but I often ponder how long it would take Blyleven to get to the majors nowadays.especially considering pitch counts and innings limits. With due respect and appreciation for your knowledge, I think you are greatly overstating the legitimacy of an old study that looks at data from 1994 to 2006. There have been so many transformative improvements in virtually every aspect of the process and at every stage of the process since then. Technology that takes much of the judgment away from the trained eyes of scouts who see prospects a handful of times who are now supported by myriads of eyes studying video. Fitness and health upgrades, perhaps most dramatically affecting IFA prospects, knowledge about biomechanics, kinesiology, psychology, better coaching tools and knowledge. I don't have numbers to support it, but my intuition tells me that players who make the top 120 or so today probably enjoy odds that have improved enough so that the odds for Graterol, Badoo, and Enslow are closer to 50% than 25%, that even despite the much worse odds for pitching prospects because of the much higher injury risks.